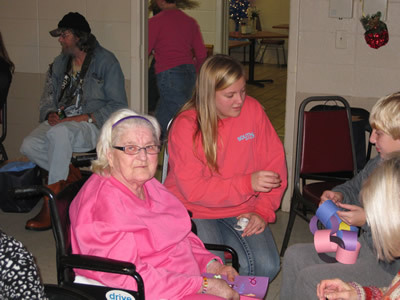 On Monday, December 23, members of Calvary sponsored a Christmas Party for residents of the Colonial Care Nursing Home. After singing a round of Christmas carols, each resident was given a bag, filled with gifts that had been donated by church members during the Advent season. 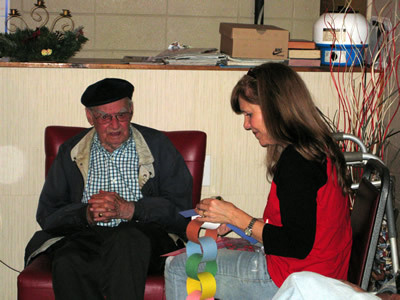 Volunteers from the church – many of them students – rounded out the evening by helping residents create Christmas cards and decorative paper chains to hang on their doors. It was a great night, and a big “Thank You” goes out to everyone who participated – as well as everyone who provided gifts for the residents. Calvary generally hosts an event of some kind at Colonial each month. For more information about how you can be involved, contact our Minister of Music, Teresa Martin.